Prey animals, rabbits try to hide their illnesses -- often until sickness becomes so severe that there is little to no chance of effectively treating it. By paying careful attention to your rabbit's habits and behaviors, you will have an easier time identifying when something is wrong. Mange is an illness rabbits can get in two forms; crustiness and itching are some signs. Sarcoptic mange, an allergic reaction caused by the burrowing Sarcoptes scabei mites, often presents as a white or a beige crust along the eyes, ears, mouth, nose and toes, and emanates a faint foul odor. A mange-affected area is likely to itch, so you may notice your rabbit scratching excessively. Trixacarus caviae, or burrowing mite mange, is rare in rabbits. Unlike the crust that may present with Sarcoptic mange, rabbits typically begin to scratch excessively only when affected by burrowing mite mange. The pain associated with the constant itching may cause your rabbit to become depressed or aggressive. If you think your rabbit has symptoms of mange, consult a rabbit-savvy veterinarian to start treatment immediately. Your veterinarian may recommend one of two options for treating the mites responsible for your rabbit's mange. Fortunately, both options are typically used to treat both types of mange in rabbits. One option is oral ivermectin or injectable ivermectin. If you opt for ivermectin, your rabbit will need a minimum of three doses of ivermectin every two weeks. Another option for treating mange is the kitten form of the medication selamectin or Revolution. Your veterinarian will prescribe the right dosage and instructions for how often to administer the medication. Rabbits typically receive the medication between their shoulder blades one time each month for a minimum of three months. Always use the dosage prescribed by your vet. Giving too much medication could result in a fatal overdose. Mites can spread very quickly. 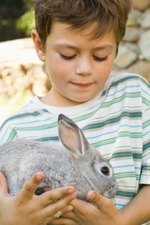 Your veterinarian may recommend treating any other rabbits you have to prevent the spread of mites. In addition, mites can fall off the rabbit into your and your rabbit's living spaces. Clean your rabbit's area and bedding when you undertake treatment to eradicate any mites or mite eggs in the area.